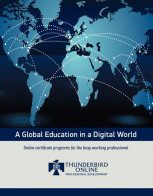 Thunderbird Online is a member of various organizations around the globe to enhance our team member’s understanding of the online learning environment, and how we can continue to provide you with the most effective and engaging learning material. Interested in a strategic partnership with Thunderbird Executive Education? Contact your Thunderbird Client Relationship Specialist today.